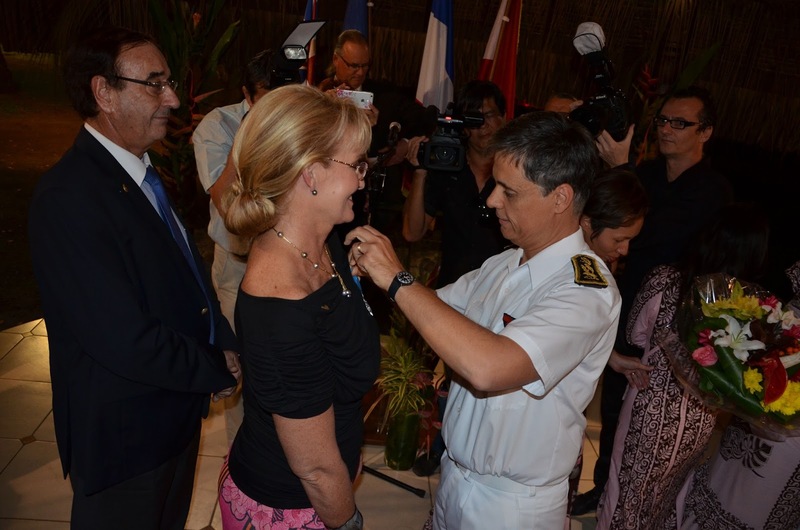 On July 1rst 2015 Cathy Gourbault Lawrence was honoured and awarded by Lionel Beffre High Commissioner of the French Republic, KNIGHT in the FRENCH NATIONAL ORDER OF MERIT in recognition of high dedication and commitment in the community for 36 years. Very early she was involved in swimming at national and international level thanks to her father who was her coach and mentor. Cathy’s father was a fireman officer who died on duty in the the South of France at the age of 46. All her life she has tried to follow his path; serving as a fire woman for 5 years, being a life guard for 18 summer seasons on the southern France beaches, volunteering as a first aid instructor. She managed to graduate at Uni at the same time two BA bachelors in French and English. all her working life since 1986 Cathy has been dedicated to adult training. Cathy created and has managed her very successful training and coaching business in human resources and management for 21 years in French Polynesia. Besides her business Cathy has been heavily involved in Junior Chamber international (Jaycees) for 13 years reaching all the levels of the NGO and being one of the 17 world vice presidents in 2001 and being awarded Outstanding World Vice President. Cathy is a JCI international graduate trainer, a JCI senator and held the office of JCI senate group president in French Polynesia. Cathy has been since 2011 a councilor of exterior trade for France (CCEF) and has been a board member of a wine club in Tahiti (AOC) for 15 years. At a personnal level, Cathy has for 18 years lived her life between Tahiti and Nagambie where she married Hugh Lawrence in 2002. Cathy created a new business 18 months ago, La Galerie de Nagambie which sells collectables, antiques and art works. What drives her ? She never stops, and has always pushed her limits aiming at new dreams, new challenges and new goals. Her strong values, her determination, her optimistic bone have always been supported by her beloved ones (families and friends); Without Hugh’s love and ongoing support she would not have been able to achieve, to grow and to blossom. Hugh’s love and support have allowed her to be herself and to serve the community (whether in JC or in Rotary). This recognition is also dedicated to Hugh. Serving the community is being part of this school of friendship where you meet some special people who will play a key role in your life and will give you the energy, the faith and the will to follow your dreams and push your limits further and further. 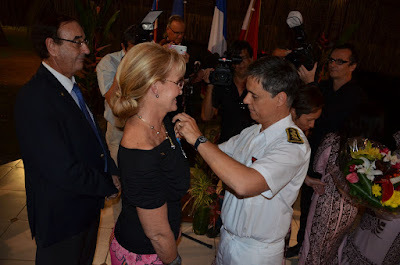 The official ceremony in French Polynesia at the High Commissioners residence was a great evening full of emotions, where friends and Hugh were gathered for a very unique moment. Cathy has been so blessed to be honoured with such a prestigious national award. Surely her dad would have been so proud. Last Saturday Hugh organized at the Nagambie Bowling Club a fantastic surprise party to celebrate the French Order of Merit Award and Cathy’s birthday with family and friends. Special moments of pride for a special award.